Was the world outside the mountains always so eventful? I think I begin to understand why I came with Aiden to the Sword Coast. There’s much in my mind, I figured writing might help get it out and let me sleep. I have a companion tonight, a new friend, perhaps in some ways a new student - to think, me as someone’s teacher… her name is Ylva, a woman from the far north who brings with her all the habits and customs of her people. Good humour, a strong sword arm, and a penchant for drink and celebration. I like her; she has an honest disposition. I first encountered her in those ruins that lay under the road from the farmlands to the Friendly Arms, and she asked if I’d teach her something about shape-shifting (I was as a bear at the time). Well, we retired to a nearby inn… ah, I can’t recall the name of the place, the one that sits just on the other side of the bridge… regardless, I don’t think I’d go there again. Necromancers. Necromancers. Damn it, I still don’t know what I should have done! Was I right in my course? Best I write this down… if either of them have come from the south, if they are from the Keep, or from Amn, I can’t afford to forget anything. The fruit rotted when it touched her lips. I saw it, the red skin turned black and the flesh collapsed into muck. And the counter, it decayed at her touch. I didn’t know what to do… at first I tried to find a little more out about her, but there was no luck there. “Came for a change of scenery,” I think she said. I didn’t want confrontation, but I did give her something of a veiled warning. She gave me one in turn, and put her hand on Ylva’s shoulder - Ylva, deep in her cups and rather unaware of the clues I was trying to drop. It turned out… alright. I think. No blood was shed, and we managed to get her to confess her craft and leave. But what was she doing here…? I looked her over, I didn’t see the sigil of the other necromancer, the one from the Keep. My mind keeps leaping back to Aiden, I worry about him, I worry that one of those people might be here for him. I shouldn’t. He’s so much stronger than he was when we met. I digress… as we encountered another almost immediately after the first necromancer left. This one was a follower of Bane, I think I saw his mark on her somewhere… she mistook something I said about Laura and thought I was speaking about her, seemed to be looking for a fight. Fortunately, she took off. I didn’t get her name, luckily, her appearance was distinctive enough that I might not need it. Elaborate black armour, near white hair, one red eye, one blue, very tall. A woman like that would stick out like a sore thumb anywhere. … Might their appearance have something to do with the refugees? Perhaps I should speak with Aaron about it. For all the trouble and mystery of the day, I’m glad to say I’ve at least found a new ally. Ylva wants to learn more of the Druid’s path, and I’d be glad to help her. I’ve kept to the forests so much here… when I go into the city with Aiden he seems to know so many people even when he insists he doesn’t. I miss him… being able to talk with him about things like this. I wonder if he’s spoken with Annaliza yet…? Best wrap this entry up. 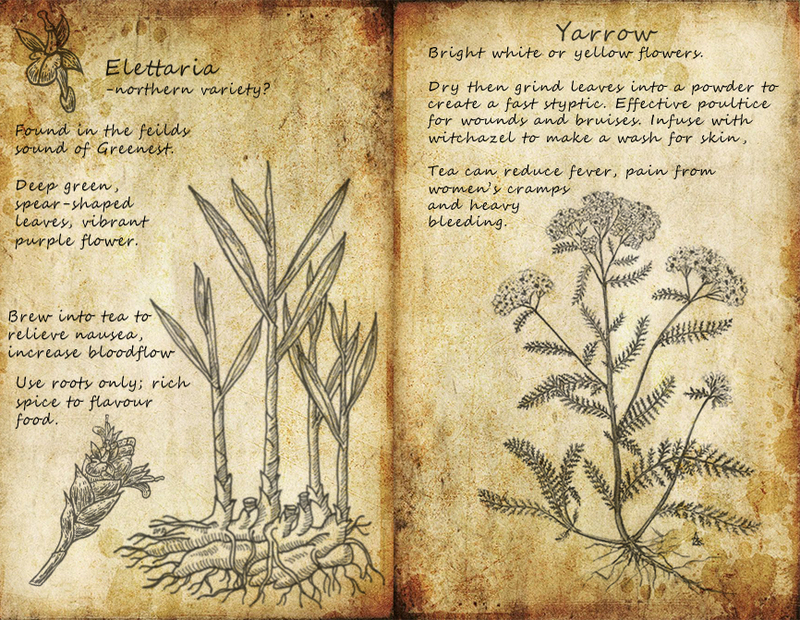 I’ve found some interesting new plants today, must document their properties. When did buildings become so claustrophobic? Either way, it seemed to lift her spirits and the amusing attention Ser David lavished on her lightened everyone’s mood. Perhaps Ser Marianne noticed my discomfort, as she suggested a hill outside Ugoth’s Beard. Aiden enjoyed his drink and I hope had a good time. He fell asleep on my shoulder; Kuma and I have him safely to an Inn to rest and I sit here now in the gardens, writing. I’ve found more interesting plants. Will ask some locals about them and add them to the collection. Aiden took me to a place in the north of “Skuldask” today. I hadn’t ventured to that part of the Coast yet, mostly stuck to the woodlands along the Trade Way. I’m grateful he remembered the place though; he must have known I’d love it there. It was a water cave, I think when from an underwater river that fed to the surface, but once inside it was an absolute trove of fungi, many different kinds I’ve not ever encountered. I’ve collected a few samples, still testing some properties. I must go back there again and see what else I can find. I must think of something to do for Aiden, for showing me that place. For all its resources, it was a beautiful cavern too… the walls are littered with luminescent plants, and the river inside widens into pools. A few creatures, too, they weren’t too happy about the intrusion but we still had a chance to relax and swim. I find I like the Sword Coast, and yes… rediscovering it with Aiden. Another memory came back to him the other day; it’s happening less frequently now but still as painful and dizzying for him. 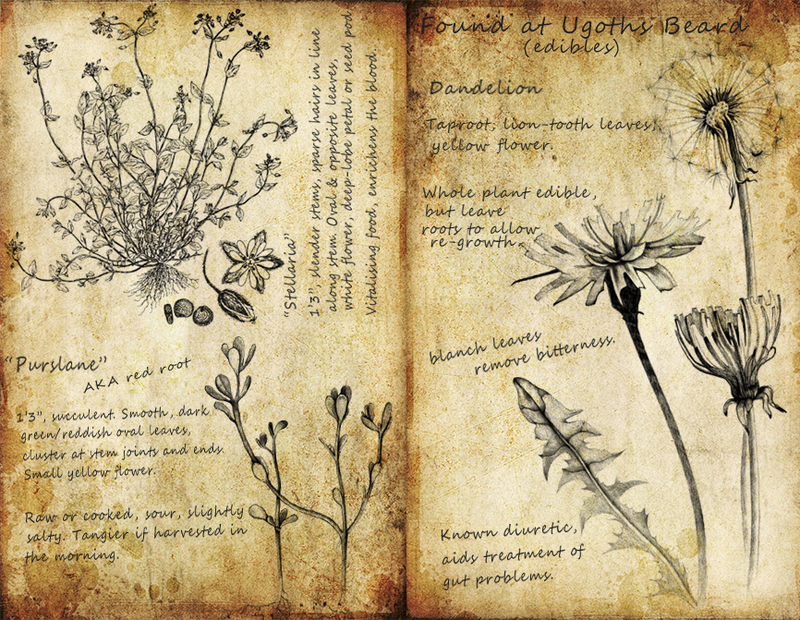 I wish there was more I could do for him… perhaps I may yet find a remedy in the flora of the coast. Or maybe all he needs is time. Twice today I’ve found myself on death’s doorstep… the memories are hazy, something of black stone and coldness, isolation. Then the life drew back into my veins and air filled my lungs and I was returned to the waking world, thanks to my companions. I’m not the warrior Aiden and Aaron are. It was supposed to be simply scouting the fields north, what we came upon was far more. Perhaps I should have turned back… but I could not have left them, neither could I have left whatever was in that crypt. I cannot call myself a hero, but at least, I will write what I remember, for the sakes of posterity. We were swarmed by hoards of undead when we first came upon the crypt, far more than Aaron had expected. They were defeated, but the crypt was shrouded in a strange, thick, black mist, suffocating and cold to the touch. I communed with the natural forces but the simple act nearly made me sick; whatever in that tomb, it’s a blight, a festering wound, the natural order sickens at its presence. Aiden gave me some invisibility potions to keep me hidden while we investigated the catacombs; the first thing we came across was a giant book, perhaps eighteen feet high, stood up and held open by a stand made of bones, a throne directly before it. Black mist agains filled the room, and a dim blue light glowed before the throne. Aaron could decipher a little of the text; a ritual had been completed only recently, conjecture would suggest one of summoning. Immediately after we were attacked again by the undead and I heard for the first time the wail of a banshee… and felt the threat of death a second time. I woke to Aiden holding me… and even there in the the darkest crypt with the stench of the undead suffocating us I felt safe. Mad, isn’t it? Aaron’s magic did much to protect us as we moved further, but we were made aware of the treachery of that place by what we next found. A small girl, a child named Amy, who seemed at first searching for her mother. But she shied away from the lights and tried to make us bring down our defences; it was all too suspicious, and we found out soon enough the child was not what she seemed. She said her mother was magic - not a person with magic, but that she was magic. She spoke of visitors that stayed forever, and the next person we met within the crypt helped untangle some of that mystery. This man was still within his senses, olive skinned and wearing the garb of a blacksmith. But his clothes were old… styled from hundreds of years in the past. He spoke of how he came to be there, that he and some dwarves carved their way through an ‘impenetrable’ stone slab, and that once breaking in were overwhelmed by a wretched stench. That he had wandered there since, and the longer he stayed, the less the other ‘visitors’ bothered him. All those shuffling monsters, people trapped, dead but not allowed to die. …And death was the last request this man made of us. While he still had some sense of himself, and had not become one of the shambling messes we fought against. He said they all wished for death, even those who couldn’t articulate it. Aaron’s code would not permit it, unless he was attacked. Aiden still fights hard to stay on the path of Eldath, and was unwilling to take an innocent man’s life. I digress. We didn’t explore every aspect of the catacombs possible; a portal had opened, and once we’d passed through closed behind us, locking us out. We had been teleported to the top of an ancient ruin in distant marshlands, seemingly unconnected with the place we just were. It’s doubtful this is the last to be heard of that place; though we explored it no curse or spell was knowingly broken. I must get stronger before things get worse… perhaps that Druid I met by Boareskyr Bridge, Kern, will have some knowledge to share. Welcome to the Sword Coast, Iolana…. I’m glad he’s chosen to follow her path, and proud of his determination. Anything to give him a moment of peace… I know he’s far more trouble than he shares. He is always giving me things, I wonder if he still feels indebted to me… I hope not. 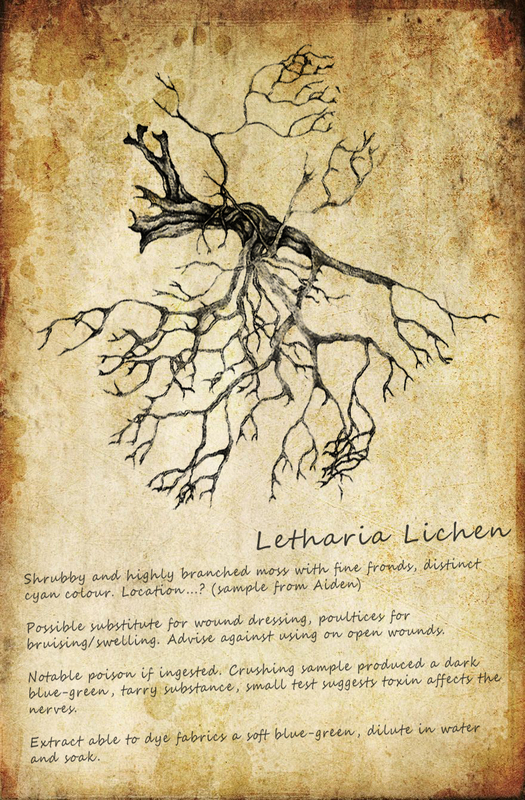 Aiden had also gifted me a curious sample of lichen, one that seems familiar from the south, if perhaps a little paler. I will leave some notes on it. My other present was from Aaron; I think he worries for me after what happened in the crypt, and offered a wand that will cast spells to make me invisible. He insisted he had no use for it but… all the same… I couldn’t use it. I am determined now to master the skill and make myself able to control such magical items - something tells me this will be important to understand. I am off to collect more herbs for the refugees. Since writing the above, I’ve happened across a series of unusual events! 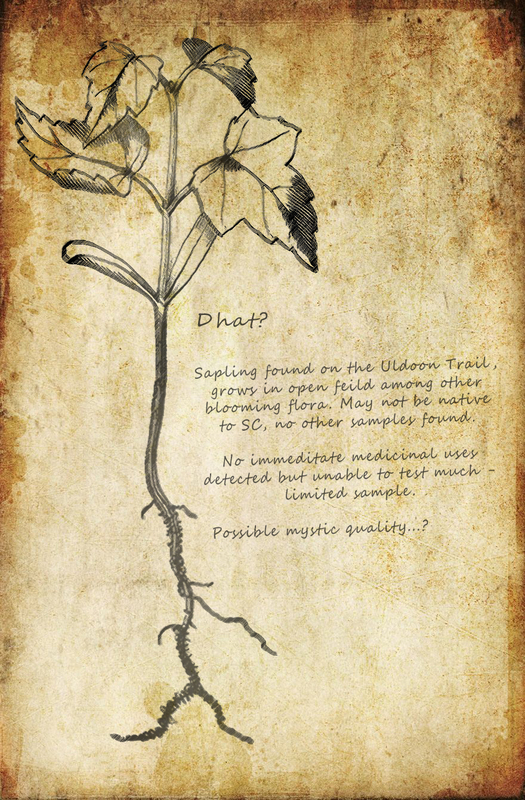 The Pixie asked me to travel to the “Uldoon Trail” and gather four rare plants, that their collection was important to the balance of nature. I was then to take them to the traders who deal with the refugees… the Rocky Creek Trade Company. It was all very unusual, and I could not discern much more from the Pixie… but how could I unravel this mystery if I did not investigate it? It took me a while to remember my way to Greenest - I have since marked a tree there, that I may travel back quickly - and arriving there felt a little aimless. Where to start looking? How was I to know what I was looking for? Something out of place, something the murmuring of nature might guide me to… luckily, I happened across others who were on hunts of their own. Mhel’gibh, or… Gears, as he asked to be called when I could not properly pronounce his name… claimed he was looking for quartz but as it turned out wanted to test a device. So, my curiosity about the device had to battle with my indignation at being lied to… Another was Miriel, a Sun Elf I believe, who happened upon us having heard of a caravan that thad been attacked. She was soon joined by two friends, Lou and Nilinor. So… a simple offer of help in exchange for help. We found the caravan, but found them too late. It had been accosted by vermin… the victims have to my knowledge been laid to rest since. 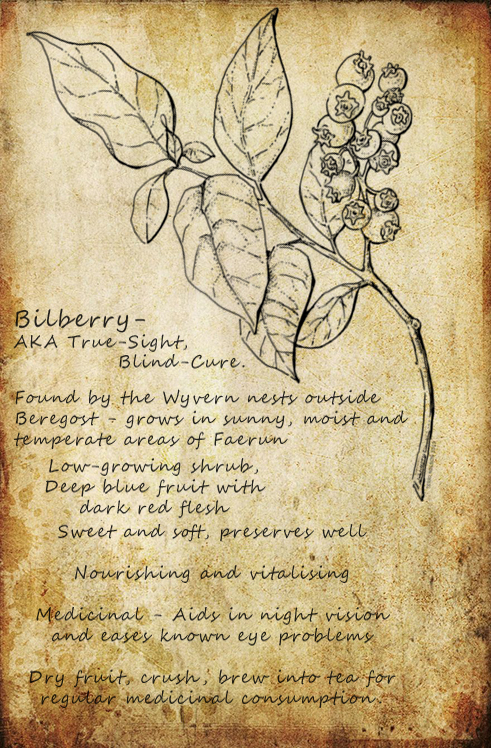 It was then Nilinor spotted an unusual clump of plants and alerted me to it; I knew upon looking that it was the right one. I can only hope that with the others, I will be so sure. That, fortunately, is not the case… both Aiden and Solomon insisted the Queen had the best intentions and is a good woman. All the same, I have decided to hold on to the sapling for now. It wants some water, but seems quite happy to live in a leaf-holder. Such dark red leaves for only a sapling… I wonder if it changes colour as it grows? It reminds me of something I saw in a book as a child, Dhat, I think it was. I guess my next stop is to speak with Queen Dharva. It’s a strange feeling, I’ve not had a home for myself since leaving the mountains in Amn. I’d treated the world as my home, any tree or cave was a bed, but now… I am the Druid of Greenest. Should the title matter to me? Perhaps not… no, it’s not the title that I care about, it’s… I’ve been invited to be a part of that community, by the Mayor herself. The Uldoon trail is mine to protect, to care for, to nurture. It’s my home. I’ll perhaps be working more with Solomon too, then. We’ve already begun to consider a plan for the health and prosperity of the lands. There is a tree, one I had gone to with him and Aiden, one we had to teleport to by a rune stone. One far south in the Cloud Peak mountains, high up in the snow. How I had never heard of this place before I do not know, but it was near impossible to tear myself away. The tree there, at this highest point in a frozen mountain ridge, it grew as if placed in the richest fields under the brightest sun. It was huge, luminous, warm, it radiated life and energy. The tree was a gift from the Gods… and what had started as a pilgrimage began to change into a plan. Perhaps, if we are found worthy… perhaps this tree will bless us with a seed or sapling, and we might take it back to Greenest, let it grow and become a beacon of new life in that new settlement. But I doubt it will give something for nothing. I will go back when I can, just to pray, to commune… otherwise, I continue to explore the Uldoon trail. There are a great many plants here, and I know the locals can make good use of them. It was nearly dawn when I came back to my cave; Aiden had wanted solitude, I willingly gave it. The air was chill when I stepped into the tiny cavern and there was nearly no light; the campfire was all but out, only embers gleaming in the darkness. The far wall of the cave housed a pool of water, one that drained away into an underground river and was fed by a thin stream from a hollow in the cave above; glimmers of starlight cascaded within too, and it was by this light I saw him. Aiden sat cross-legged at the edge of the pool, head drooped, silent and still but not sleeping. Kuma had curled herself up by a far wall and sniffed the air when I passed, but I waved her down gently to be still. “…He’s gone now,” Aiden whispered, the soft words echoing across the stone walls. I nodded, and took a seat down next to him. “Are you unwell?” I broached, and he shook his head, knowing I meant physically. His mind though was still uneasy. Silence hung in the air a moment. Silence fell for a while, but when I glanced to Aiden I was surprised to find him smiling at me. “…You want to help her, don’t you?” He asked and I blinked. “…But Heart told me about the Drow, seemed to validate her story.” I hung my head a little; my instincts wanted to reach out to Isrea, to hope that showing her some kindness would help her along the path away from evil… but reason only cautioned me. There was just too much risk. So, I write. It helps to clear my head. I digress. It was in these caves I met a stranger and it seemed he had the same intention of pushing back against this clan of Orcs. When I happened upon him he was badly wounded, and I did what I could to help him. He never gave me his name… only a square of parchment, which would turn out to be a treasure map. I must confess, the intrigue of solving a puzzle and hunting a prize was far more enticing than the promised treasure at the end, and it was Terri who joined me on the hunt. We roamed the island off Ulgoth’s Beard (mustn’t forget, there is a pool there with lotus!) and Terri proved herself to be both formidable, and fun. …She reminds me of my sister, that’s what it is. Even physically, the blonde hair and bright eyes. The prideful streak, and extroverted demeanour… maybe that’s what started it, this wondering about Ashpurta… and the people I left there. Seeing Aiden connect so much with people of his old life has likely contributed; he told me about his life back in Cormyr, his reluctance to return no matter how he misses it. Aiden still sees himself as tainted, incomplete, but people are never truly complete. We cannot ‘finish’, we are always growing, learning. He’s so brave, to come back here and start his life anew and connect with these people, determined to make things right even where he hurt them in the past. He hasn’t found Annaliza yet… I can’t decide if I want him to or not. If he finds her, that love may rekindle, and they’ll be reunited and who knows, even follow through with that engagement. There are moments where I begin to really believe he favours me… as a lover might. I know it’s become something of a joke to our immediate friends. I know how we must look, we’ve grown so close. No, I must protect my heart from considering such feelings. He is tied to Annaliza, and I’m sure still loves her. Funny… it’s in this moment that Dorran’s words come to me. He told me once that he closed himself off from personal relationships, so that he might open his mind and heart to the rest of the world. It was the ultimate objectivism, the truest neutrality. I question that wisdom… but even as I sit here and think, I can’t find any satisfactory answer. Eldath… your path has brought me such peace, and I’ve tried to hard to overcome my tempestuous habits. Control it, don’t feel it, don’t let petty things influence your mind. That person would not have bothered me, not once, but it was as if his actions were a pin-prick that made something else burst. No, I know why I was hurting in the first place… and to write about it will only indulge the feeling. I have much bigger things than myself to think about; the refugees have at last arrived in Greenest, and while Queen Scatterheart - I must correct myself for earlier calling her Mayor - while Queen Scatterheart has put these people to work, it is still a sudden influx of forty people to the town. It will grow, and rapidly, and I am working to be sure they do not harm the lands and know how they must live in harmony with it. That reminds me, I must speak again with Queen Scatterheart about these plants I’m finding. I have a theory now as to why the Pixie warned me these strange plants threatened the balance of nature along the trail… they are invasive species, and could choke out other flora, or become a toxic threat to fauna. I suspect the seeds might have been carried here from the more frequent trade caravans that pass along the trail. 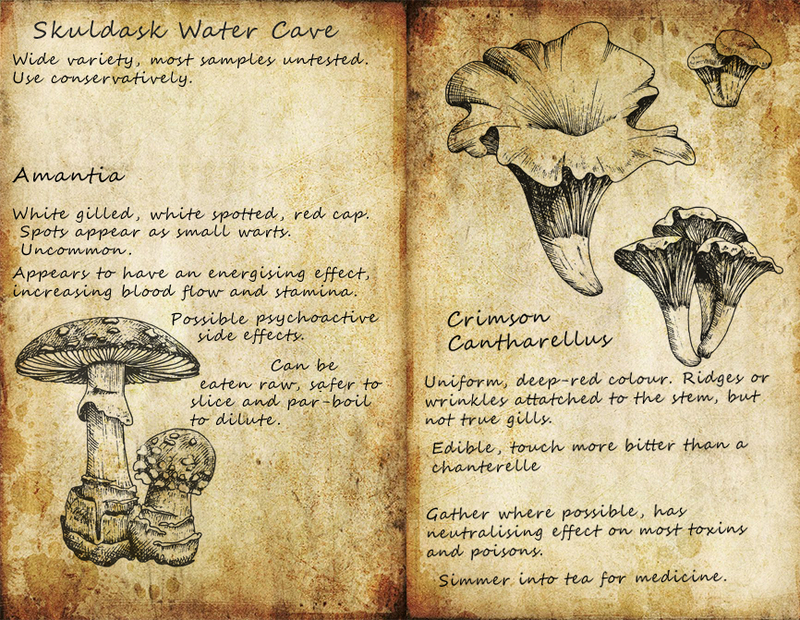 Aiden has suggested these could be cultivated, if their spread can be controlled. This is not a bad idea; most of what I find have powerful medicinal properties, and creating medicines would be a good jobs for many of our new citizens. How much happened in so little time. The dust has finally settled, and I find my heart relieved of a burden I hardly knew I was carrying. The whole Coast is livened in the wake of a great victory against the Devils; they had been pushed back, their camps razed, and the threat -for now at least- has been greatly lessened. My thoughts wander now to Aaron; so bound by his sense of duty I can hardly tell if he had a moment to enjoy the success of his battle. No matter how much is already on his shoulders, the man will always take up another burden. I know little of how his part in the campaign went, as my aid was enlisted under Wren Di'Corvi (yes, I actually marched to battle… though my part was far less impressive than the seasoned adventurers that surrounded me.) I’ve not spoken a great deal with Wren, but now having seen her I cannot doubt how fearless (and fearsome) she is. If Aiden does make the decision to offer his blades to the Watch, I am glad to say I have great faith in his commander. Curiously, we were not the only Eldathyns to take part; a healer, Dove, lent her talents to the fighters and likewise saw the irony in our attendance. ‘The paths we walk for peace,’ said she. I’m glad to know her now, to my knowledge I’ve not come across another Eldathyn here in the north, and she very much embodies the teachings of our Lady. On the note of prospective friends… I’ve at last met Sane, the Arch Druid. I was compelled to like him immediately, though now reflecting on it, that may be because he reminds me so very much of Doran. I still miss the old man… and so caution myself not to look at Sane as his surrogate, else I’ll never get to properly know his character. 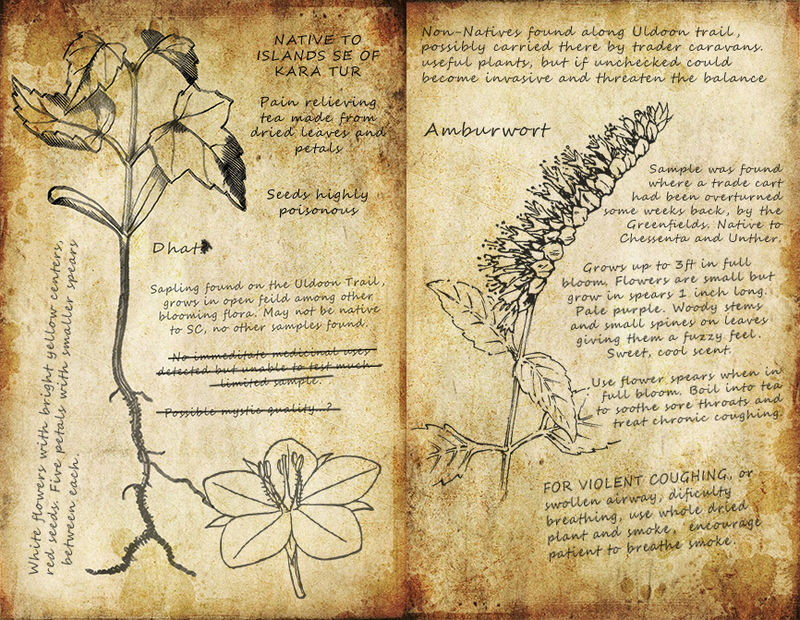 It has swayed me though; knowing more people of the Circle and witnessing Sane’s magic, I have decided to offer the plants gathered from the Shrines and ask for a place with them. It occurs to me now that Adelaide very likely counselled him in other matters too. A thank-you might be in order… things having taken such a turn with Aiden and me. After the battle, after the Ball and all that transpired between, I no longer fear losing my dearest friend to another’s attentions. While the future still looms uncertain, I am, for the moment… content. I am now a member of the Elder Circle! A strange feeling, but not a bad one after having lived such a habitually solitary life. Indeed, it’s given me a sense of connection I’ve not felt before; there were other wanders like myself in the Small Teeth Mountains, there was Doran who became dear to me as an actual father might have, and of course the myriad of new friends made here on the Sword Coast… but the Circle, it’s different. After my trials they welcomed me, shared with me their secrets, and for the first time since… well, since ever, I think I’ve found my people. The trials were not just for me, but another fellow, ‘Creepy-Scales’. I’ve heard that name about before, Terri was asking after him however I’m not intimate with the details. He’s… unusual. So bound up in bandages, and speaks as if every syllable hurts him. I wonder at his affliction… perhaps there may be a cure or at least some remedy to ease his pain. Perhaps I should ask, though the question could be a little invasive. He’s a good bowman, though, and an effective scout with a tread softer than a whisper. Our trials took us and other members of the Circle to the summit of the Grey Peaks; Creepy-Scales was to scout, I… to lead. Had this trial taken place at an infirmary I think I would have been far more assertive and sure of myself… as it was, I thought instead of Wren, and how she lead her troops. The excursion ended in success, though upon our descent we encountered Morgan Blackrose, and a few of those Ebon Blades. The encounter luckily didn’t end in violence… though Admorin seemed eager to put the Necromancer to rest. A brow too was spotted outside Soubar - she was eager to escape though I think I would be too, in her shoes. The last of the trials was luckily not so dangerous; a series of questions put to me by Sane. I think not only to test my wisdom but also my character… either way, I write now from the sanctuary, a place so embraced by Eldath it’s difficult to leave. Still, there are duties, a life outside this glade that seems to stand still in time. I will not elaborate even here; it is best to practise the necessary secret-keeping. It does feel strange not to tell all to Aiden, I will admit. I am so used to him being my absolute confidante. Though he understands these are not my secrets to tell, and does not push the matter. Aiden has joined the Watch, and I find myself to be quite proud of him. Their… doctrine might encourage him away from Eldath’s pacifist teachings, but then again, my Lady does allow for the protection of oneself, and of the innocents. Aiden is a knight at heart… and he was so overjoyed by his new calling, how could I be anything but happy for him? One last acquaintance of note; Destin. A fair-haired soldier who introduced himself as leading “The Hunters of Vengeance”. The water cave where the amanita and crimson chanterelles grow is close to their territory, so we crossed paths, and seeing I was Eldathyan he offered his sword in order to spare me the trouble of combat. A gallant gesture, and it may prove useful to know more of his faction. 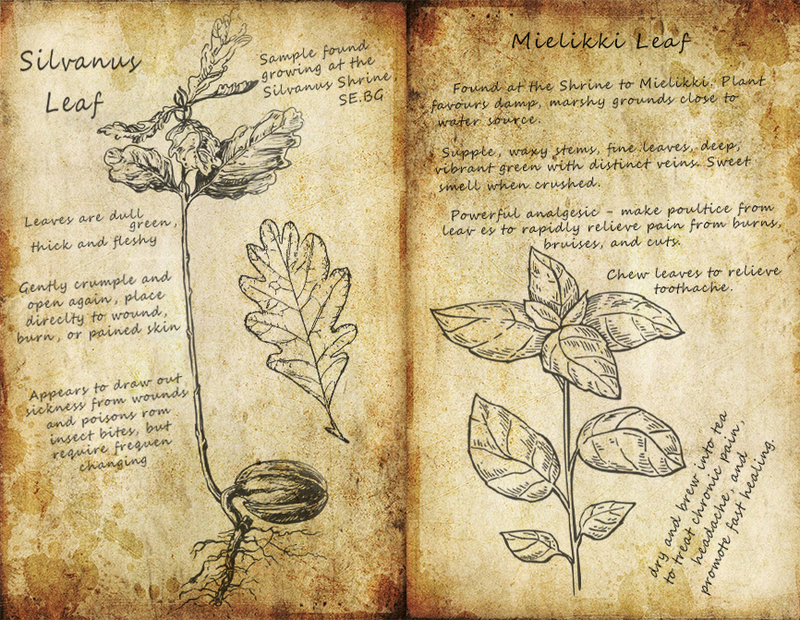 I will close this entry for now; the leaves should be softened enough to make the salve. Poor Kuma has got some sort of a bug bite that’s itched her terribly, I am hoping a combination of those leaves found from the Silvanus and Mielikki shrine will soothe her. I suspect Druid Groves are actually full of animals because we’re all introverts and need an excuse not to talk to people. Astounded how long it has been since I’ve written; I have added fresh parchment to this journal for the occasion… I had meant to make a habit of this, but lately my ventures into society have really quite dwindled. I think I’ve fallen into the old habits from my years of prehistoric living in the Small Teeth Mountains. Perhaps it is the encroaching change of the season? The change of any season always signalled a new sort of work to start, and in this case, the wilderness shaking off its wintry sleep is probably what has called me back to it. I’ve been neglectful of more social duties though… and as I was sketching a plant today found myself instead sketching faces of people, realising then that I missed their company. I also realised I am not very good at drawing faces. Shadow Druids in Cloakwood have been active; worshippers of Malar, from what I understand. They have been poisoning the woodlands and its inhabitants with a strange toxin, one that causes rapid decay in Dyrads, and a similar ruining of constitution in people. Rapid lethargy, bleeding from the eyes... perhaps in humans this has an anticoagulating effect? Internal bleeds? 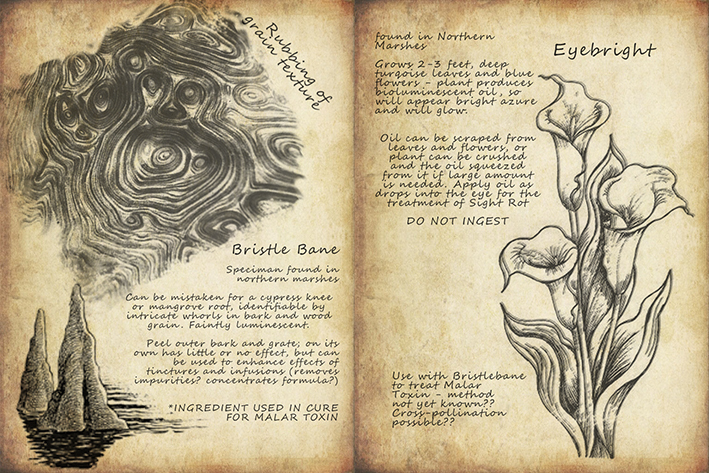 Conventional medicines to not work and magical healing only causes more harm- similar to heal magics on the undead. 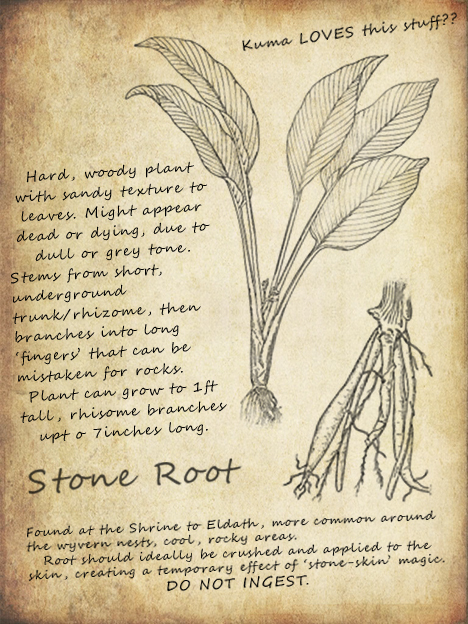 Two plants were identified as possible cures, however the way they are to be applied is still being investigated. 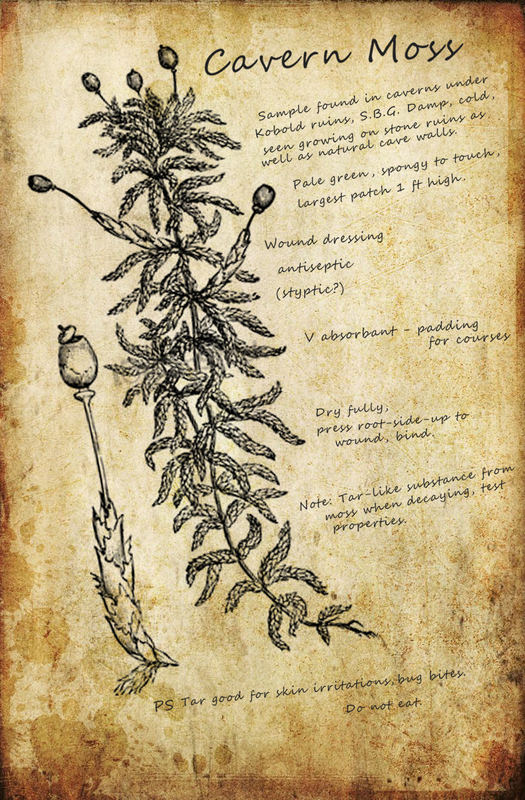 The Circle is looking for a decent alchemist to have a shot at it and we discussed the possibility of cross-pollination, though I fear the nurturing of a new plant species would leave everything far too late. The Shadow Druids nearly destroyed the moors... we were lucky to rescue what we did. Hopefully enough specimens to regenerate what was lost, too. but the most pressing matter is Raivan, who suffered a poisoning of the toxin. The last I saw of her, we had delivered her back to her people deep in the Misty Forest. Must speak to the others soon. will keep researching in the meantime.